Product prices and availability are accurate as of 2019-04-12 08:09:54 EDT and are subject to change. Any price and availability information displayed on http://www.amazon.com/ at the time of purchase will apply to the purchase of this product. One Ninja Cup Set: Two clear cups with gray lids (please read entire description) Single Serve 16 ounce cups with FOUR TABS. Look at the pictures to confirm the cups you are replacing have four tabs and has a base like the last picture. 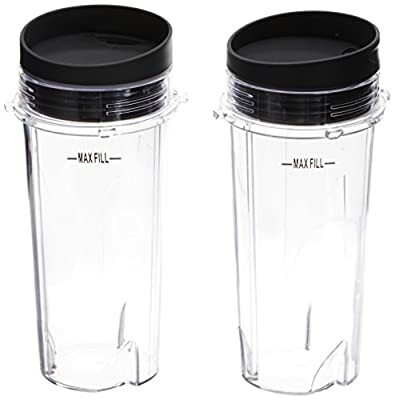 Do not order if you are not sure...some smaller Ninja blenders (Pulse) have 3 tabs and A Ninja Blender that did not originally come with single serve cups will not work with single serve cups These cups fit these model number blenders. (The model number is located underneath the base of the blender and must start with a BL) : BL660 (1100 watt), BL663 (1100 watt), BL740, BL770 BL771 BL772 (1500 watt), BL780 (1200 watt), BL810 BL820 BL830 Cup Diameter is 3"